The 52nd legislature of the Student Government Association (SGA) on Monday night established the SGA Elections Reform Commission, confirmed one of two undergraduate University Senate representatives who were nominated and approved a bill to begin club membership audits. SGA Chief of Staff Ben Palmer (18Ox, 20C) and College Council (CC) Chief of Staff Jacob Hicks (18Ox, 20C) added four amendments to Bill 52sl27, which would establish an SGA Elections Reform Commission separate from the Elections Board after it was tabled at last week’s meeting. The new amendments open participation in the Commission to all SGA legislators and executive board members, including the attorney general and Elections Board members, and require the Commission to update the SGA legislature twice a month on the Commission’s proceedings. Palmer said the Commission would make suggestions to revise and clarify the Elections Code to “avoid what we now have, which is opaque and confusing” by the last SGA legislative session in Fall 2018. The SGA president and executive vice president would select a student to head the commission, according to the bill. During the previous two meetings, some SGA legislators expressed concern over the bill adding more bureaucracy, but Palmer said the bill attempts to avoid “bureaucratic inefficiency” and instead increases conversation about the Code. SGA Senior Representative Owen Lynch (17Ox, 19C) said the Commission could prevent problems that might arise in future elections. “I think at a time when we had, arguably, one of the biggest SGA catastrophes of our academic career that just happened in the Spring … I don’t see why we wouldn’t add a single check,” Lynch said. In response, SGA Sophomore Representative Zion Kidd (21C) said the “check already exists” and that the Elections Board has time to review the Code. The main duties of the Elections Board are to oversee the annual Spring and Fall elections. Kidd said he preferred to add more members to the Elections Board rather than create a new Commission. The bill passed with seven legislators voting to approve it, four voting against it and two abstaining. Speaker of the Legislature and Sophomore Representative Lori Steffel (21C), who may only cast a vote if the outcome would change, voted in support of the bill. Elections Board Chair Justin Cohen (20C), who was present at the meeting, told the Wheel he was “very excited” the bill passed. SGA President Dwight Ma (17Ox, 19C) and SGA Executive Vice President John Priddy (19C) proposed Bill 52sl34, which would nominate Caroline Silva (22C) and Austin Graham (21C), who served as a freshman representative on SGA last year, as undergraduate representatives in the University Senate. 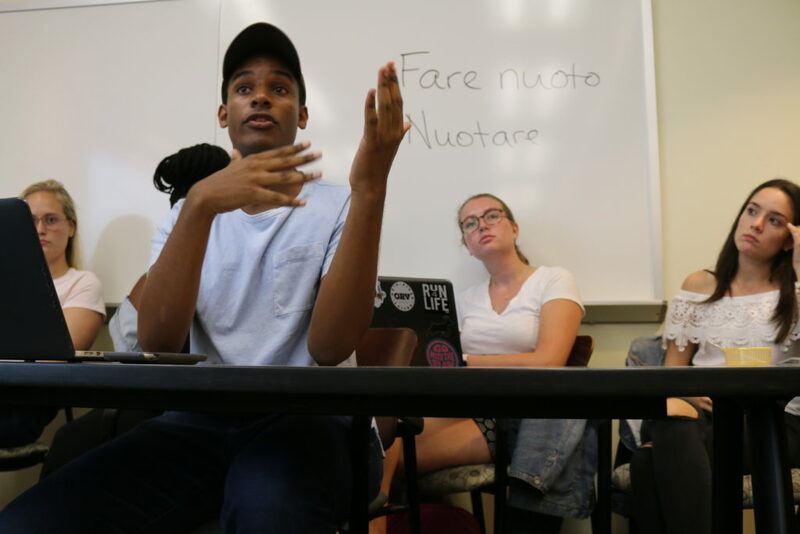 Priddy automatically serves as a student representative on the University Senate because he is the executive vice president of SGA, according to the Code of Elections. The Legislature approved Silva unanimously, but Graham received only six votes in favor, one short of the seven required for confirmation. 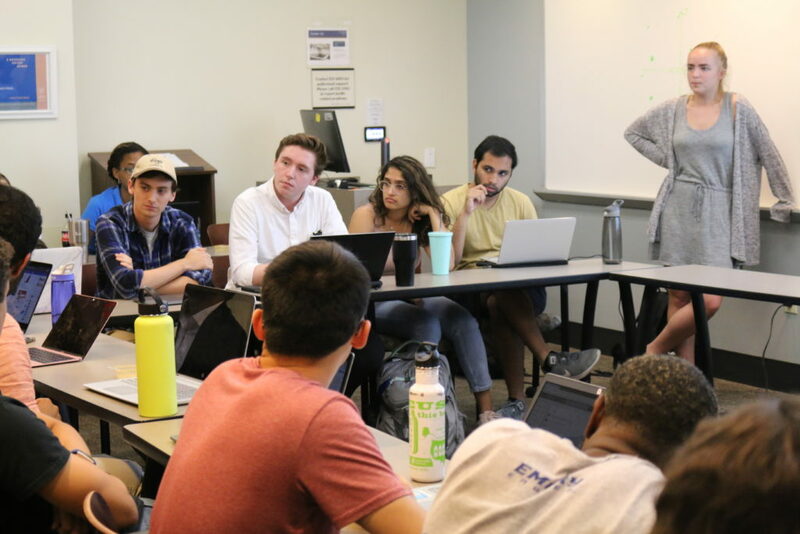 The University Senate, which is composed of Emory administrators, faculty, staff and students, makes “recommendations regarding all matters of general University interest,” according to its website. When asked to speak about their qualifications during the meeting, Priddy said he and Ma were “super impressed” with Silva and Graham after reviewing more than 40 candidates. Kidd said he trusts the opinions of Ma and Priddy but also said SGA had “problems” with Graham’s comments at past SGA legislative meetings when Graham was a spectator after losing his re-election. “He’s a very nice person — I think he does mean well by his actions, but how he goes about it sometimes it’s not the best way,” Kidd said. Priddy said Graham was justified in being outspoken during the first 52nd legislative meetings. Bill 52sl32, which was introduced last week by BBA Council President Jay Krishnaswamy (16Ox, 19B), would audit undergraduate club participation and adjust the Student Activities Fee (SAF) split based on results of the audit. According to BBA Council SGA Representative Geoffrey Tseng (19B), Emory Student Nursing Association (ESNA) President Jasmine Wilson (19N) and Oxford SGA President Liam Dewey (19Ox) affirmed their support of the audit to Tseng after Priddy commented in last week’s SGA meeting that no other divisional council seemed in favor of the bill. Krishnaswamy revised the clause that specified non-participating clubs’ budgets would be reduced by 25 percent to say that penalties for non-compliance would be determined by club’s divisional council. CC Vice President Hemal Prasad (19C) said during the meeting he agreed with the removal of the budget cut penalty, but he said the bill should undergo more review. “I don’t think that goes far enough, and I think our objections to the bill have been misconstrued,” Prasad said. Hicks said the new audit would not be representative of the full year’s participation in clubs because it only checks participation in the Fall semester. Krishnaswamy said there is not enough time to audit in Spring 2019 and modify the Student Activities Fee (SAF) for changes in the 2018-2019 academic year. The bill passed unanimously with eight votes. Several legislators left the meeting because the meeting ran overtime and did not vote. Editor’s Note: Attorney General Kaia Ordal (17Ox, 19C) asked the Wheel not to publish parts of SGA’s debate on Graham’s fitness for candidacy despite the meeting being public. The Wheel published contents of the legislators’ debate regarding Graham’s nomination to the University Senate because it occurred during a public SGA meeting and adds context to why Graham did not receive the legislature’s approval. Silva is a contributing writer to the Wheel. She was not involved in the composition of this article. CORRECTION (9/26/18 at 11:28): A previous version of this article stated that the Constitutional Council would determine penalties for noncompliance with the club audit bill. In fact, a club’s respective divisional council will determine penalties for noncompliance.